Groton had its precarious beginnings when John Tinker followed Indian Trails from the Bay area and settled near the mouth of Nod Brook on the Nashua to set up his trading post to do business with the Nashaway Indians. The area was known as Petapawag, an Indian name for swampy land. Adventuresome families soon followed, on foot or on horseback, and found it a good place for the necessary farming and fishing. In 1655, this trading post evolved into a formal settlement called The Plantation of Groton, which encompassed all of what is now Groton and Ayer, nearly all of Pepperell and Shirley, a large part of Dunstable and Littleton, as well as smaller parts of Harvard, Westford, Nashua, NH, and Hollis, NH. It was named in honor of one of the original Selectmen, Dean Winthrop, who was born in Groton, Suffolk County, England. In 1676, during the King Philip’s War, Indians attacked the town and burned down all but four garrison houses. The surviving residents fled to Concord and other safe havens returning two years later to rebuild the town. 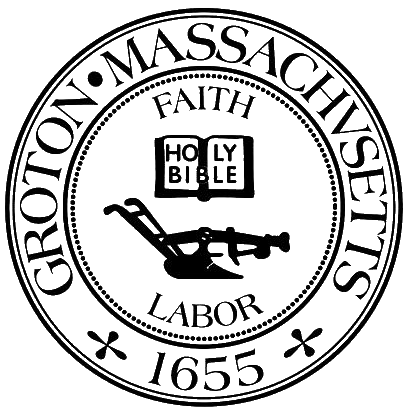 As Groton’s population grew so did many supporting industries including a soapstone quarry, a large hop-growing industry, a brick factory, a saw mill, a grist mill, and a pewter mill which produced tea pots, plates, cups, and buttons. West Groton lies within a “V” formed by the Nashua and the Squannacook rivers. The old red brick Groton Leatherboard factory still stands on the Squannacook River as an example of the late industrial period of a New England mill village. West Groton has its own post office, fire station, and water department. In the past, other areas of Groton were designated as east, south, and north, but only West Groton’s name survived. The Lost Lake area was created at the turn of the century through damming nearby streams and flooding an existing field. It was popular as a summer resort for city residents and today both permanent and summer residents live there. Located at the corner of Main Street and Lowell Rd (Rt 40) This church was originally built in 1755 as a gathering place for town meetings and other important political and social events. 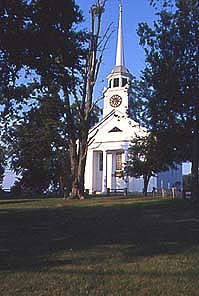 In 1775, the town common in front of the church was the assembly area for the Groton Minutemen who joined in the battle against the British in the towns of Concord and Lexington. The church bell was cast by Paul Revere Foundry. 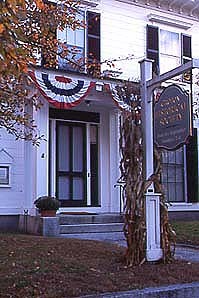 Located on Main Street Built in 1851, the same year George S. Boutwell became Governor of Massachusetts, it is now the Groton Historical Society Museum and is open by appointment only. Various periods of furniture and artifacts are on exhibit. There is no admission fee. Located on Hollis Street Visiting hours – dawn to dusk It is fascinating to stroll through and read the sentimental epitaphs and to note the quaint designs on the markers. 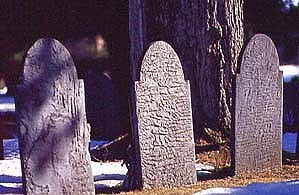 Many of Groton’s first settlers and their descendants are buried here with the earliest surviving tombstone dating back to 1704. There are graves from the Revolutionary War, the Civil War, and the War of 1812. Rubbing is allowed by permit only. 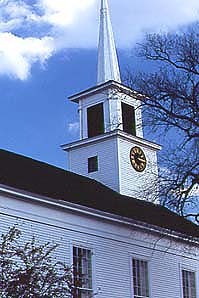 Located at the corner of Main Street and Legion Road The 90-year old clock, given to the town by Dr. Samuel Greene is located in the clock tower of the Old Baptist Church. Paul Matisse, as current resident, has the privilege of maintaining the clock.